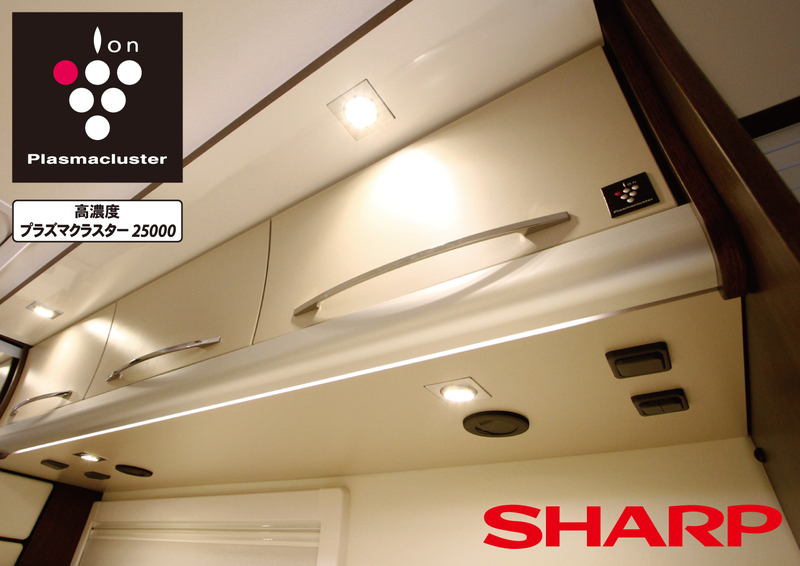 As we always work upon campervan development in the aim of “Cabin Comfort,” we’ve come to one solution with Plasmacluster* 25000 by close collaboration with Sharp Corporation Japan. Requests received from customers such as “elimination of odor from pets and onboard cooking,” and “requests for clean air environment in cabin,” we tried several equipment and chose the best solution, “Plasmacluster*.” It provides fresh air by creating ion which is the same formula as that of natural world and is the original technology of Sharp. Plasmacluster* is adopted largely from household to major facilities and factories around Japan and overseas, and its product reliability is very high. Toy Factory requests Sharp for the collaboration for product development for the 2nd time as “On-board Solar System with Solar Panel” in 2008 was our 1st collaborated work. After long period of tryouts and experiments, we are successfully able to mount Plasmacluster* 25000 by original designed built-in method. New model vehicles of Toy Factory with Plasmacluster* 25000 will be on sale from 2015. * “Plasmacluster” and “Device of cluster of grapes” are registered trademarks of Sharp Corporation in Japan, USA and elsewhere.